I just finished reading the great tome that is ‘Wolf Hall’ by Hilary Mantel. The novel is about the rise of Thomas Cromwell in Henry VIII’s England. It’s one of the most challenging but rewarding novels I have read recently. Hilary Mantel has a writing style which defies description. It is almost impossible to figure out how, technically, she wrote this novel. It is from Cromwell’s perspective, but not quite written in the first person. It is, as a friend described it, a ‘sticky read’ because of this. Mantel seems to only use speech marks when she wants to. This means that for quite a lot of the book, you’re not sure who is speaking! I think this is deliberate, however. Statecraft and politics is a murky business. It’s virtually impossible to know how political decisions are made – witness the current Chilcot inquiry into the Iraq war. The novel so convincingly creates the Tudor world that one feels very much as a ‘fly on the wall’. Mantel’s style of not explaining much or who’s who serves to create this sensation that you have travelled back in time and observed the events first hand. Just as if you had been able to observe the events first hand, you are on your own and there isn’t anyone there to explain what’s happening. I was surprised to come to like the character of Cromwell. I think it’s a superb portrait. Although the book is told from his perspective, and he is undeniably the focus of the story, he still emerges as quite a mysterious figure who plays his cards close to his chest. I was also amazed by quite how cosmopolitan the politics of the day were – Cromwell speaks numerous languages and so does the court. Often, audiences with certain people begin by a discussion of which language to speak in. This is an England I hadn’t imagined. I think it helps if you know a little about the period the book covers – essentially the divorce of Henry VIII from Katherine of Aragon and the martyrdom of Thomas More and John Fisher. There is a subtle use of dramatic irony in the novel. The Wolf Hall of the title is the home of the Seymours, and Jane Seymour, a young woman in the story, appears fleetingly throughout, and the seeds are sown in Cromwell’s mind for the future. It was quite strange for me to read a book with characters who are now Catholic saints – the sister school to my own in Southend was St Thomas More and there is a church in Southend named for St John Fisher. They are not particularly saintly in the book! I think Mantel depicted the religious and technological upheavals of the day well. The invention of the printing press and the translation of the Bible into the vernacular had begun a revolution. There is a slight bias in the book towards the reformers, but this is appropriate given Cromwell’s own religious persuasions. As I write this I realise what a brilliant novel this is. It is not an easy read, but having finished it now I have been given a rich picture of Tudor England that will stay with me for a very long time. Far more satisfying than the playful Philippa Gregory books such as ‘The other Boleyn girl’ (which I still love, but this is in another league). If you do choose to read the novel my advice would be to keep on reading, even when you’re not sure what’s going on. Try not to decipher every conversation or you will be held up and get frustrated. Also, in general, when Mantel speaks of ‘he’ or ‘him’ she is generally referring to Cromwell (it took me a while to realise this). One of the best historical novels I have read. 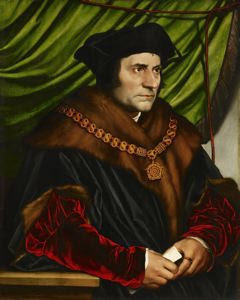 You can see so clearly whose ‘side’ Holbein was on! What is brilliant about Wolf Hall, is that you can almost recognise these figures from their portraits.